February 10, 1907: Colorado River Levee Repaired. In late 1904, water from the Colorado River started leaking from irrigation ditches built for the Imperial Valley into what would become the Salton Sea. After a flood on the Colorado River, the sea filled, and it would take two years of effort with many missteps to close the breach and control withdrawals from the River. Commentary: There are several accounts of how the breach in the banks of the Colorado River was repaired. One account by Laflin puts the repair date as January 27, 1907. 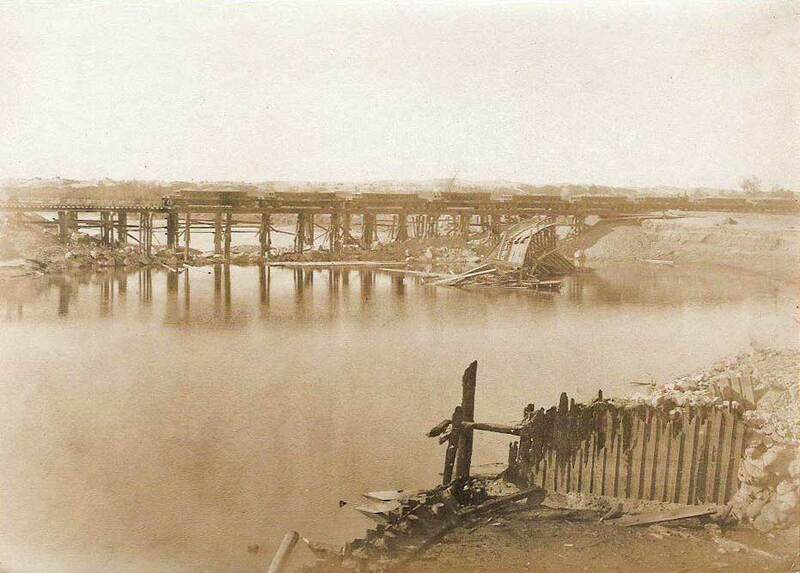 Another by Kennan stated that the dumping of rock from the first trestle began on January 27 and was completed on February 10, 1907. Go to the January 27 blog post for Laflin’s account. Thanks to Ellen Lloyd Trover for bringing this to my attention. Here is Kennan’s version. Reference: Kennan, George. 1917. The Salton Sea: An Account of Harriman’s Fight with the Colorado River.” New York:MacMillan. 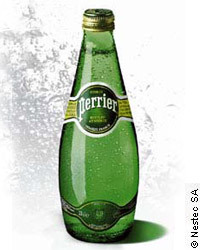 February 10, 1990: New York Timesheadline— Perrier Recalls Its Water in U.S. After Benzene Is Found in Bottles. by George James “The company that made bottled mineral water chic is voluntarily recalling its entire inventory of Perrier from store shelves throughout the United States after tests showed the presence of the chemical benzene in a small sample of bottles. The impurity was discovered in North Carolina by county officials who so prized the purity of Perrier that they used it as a standard in tests of other water supplies. The Food and Drug Administration said it is testing supplies in California and other states. In a written statement issued last night, Ronald V. Davis, president of the Perrier Group of America Inc., said there was no significant health risk to the public. But the statement did not go into the details of the recall, how it would work, the number of bottles to be recalled and the impact on a company that has built its success on its product’s image of purity and stylishness. This entry was posted in Year 7 TDIWH and tagged benzene, bottled water, drinking water, levee repair, Perrier, public health, Salton Sea, Southern Pacific Company, water, water history on February 10, 2019 by safedrinkingwaterdotcom. 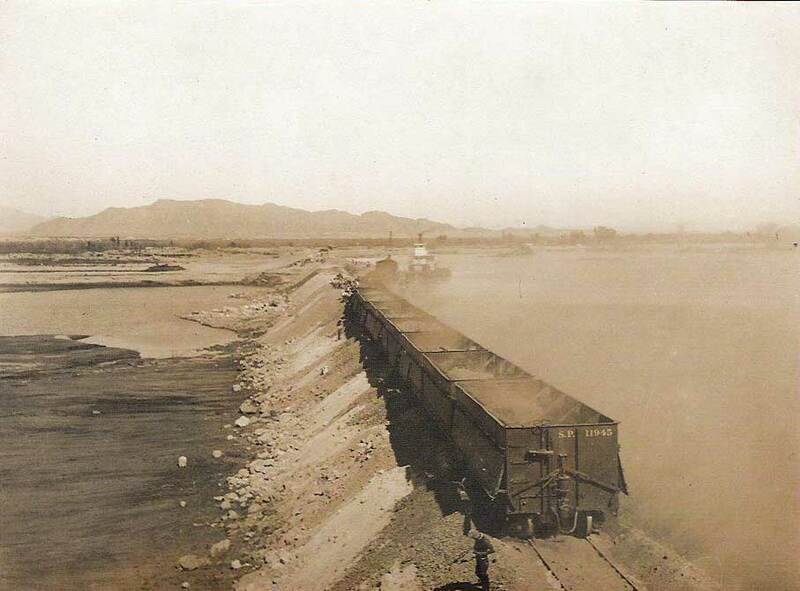 January 27, 1907: Colorado River Levee Repair Begins. In late 1904, water from the Colorado River started leaking from irrigation ditches built for the Imperial Valley into what would become the Salton Sea. After a flood on the Colorado River, the sea filled, and it would take two years of effort with many missteps to close the breach and control withdrawals from the River. Commentary: There are several accounts of how the breach in the banks of the Colorado River was repaired. One account by Laflin puts the repair date as January 27, 1907. Another by Kennan stated that the dumping of rock from the first trestle began on January 27 and was completed on February 10, 1907. Go to the February 10 blog post for Kennan’s account. Thanks to Ellen Lloyd Trover for bringing this to my attention. Here is Laflin’s version. Reference: Laflin, P., 1995. The Salton Sea: California’s overlooked treasure. The Periscope, Coachella Valley Historical Society, Indio, California. 61 pp. (http://www.sci.sdsu.edu/salton/PeriscopeSaltonSeaCh5-6.html#Chapter6Accessed October 11, 2014). Commentary: That is an understatement. Clearly, the treatment of surface water put into the system to fight a fire was not properly done and people died. Reference: “Water Origin of Typhoid Epidemic.” 1916. Municipal Journal. 40:4(January 27, 1916): 111. This entry was posted in Year 7 TDIWH and tagged drinking water, Lake Charles, levee repair, Louisiana, public health, Salton Sea, Southern Pacific Company, typhoid fever, water, water history, water treatment on January 27, 2019 by safedrinkingwaterdotcom. Reference: Laflin, P., 1995. The Salton Sea: California’s overlooked treasure. The Periscope, Coachella Valley Historical Society, Indio, California. 61 pp. (http://www.sci.sdsu.edu/salton/PeriscopeSaltonSeaCh5-6.html#Chapter6 Accessed October 11, 2014). This entry was posted in Year 6 TDIWH and tagged drinking water, Lake Charles, levee repair, Louisiana, public health, Salton Sea, Southern Pacific Company, typhoid fever, water, water history, water treatment on January 27, 2018 by safedrinkingwaterdotcom. This entry was posted in Year 5 TDIWH and tagged drinking water, Lake Charles, levee repair, Louisiana, public health, Salton Sea, Southern Pacific Company, typhoid fever, water, water history, water treatment on January 27, 2017 by safedrinkingwaterdotcom. This entry was posted in Year 4 TDIWH and tagged drinking water, Lake Charles, levee repair, Louisiana, public health, Salton Sea, Southern Pacific Company, typhoid fever, water, water history, water treatment on January 27, 2016 by safedrinkingwaterdotcom. This entry was posted in Year 3 TDIWH and tagged drinking water, Lake Charles, levee repair, Louisiana, public health, Salton Sea, Southern Pacific Company, typhoid fever, water, water history, water treatment on January 27, 2015 by safedrinkingwaterdotcom.